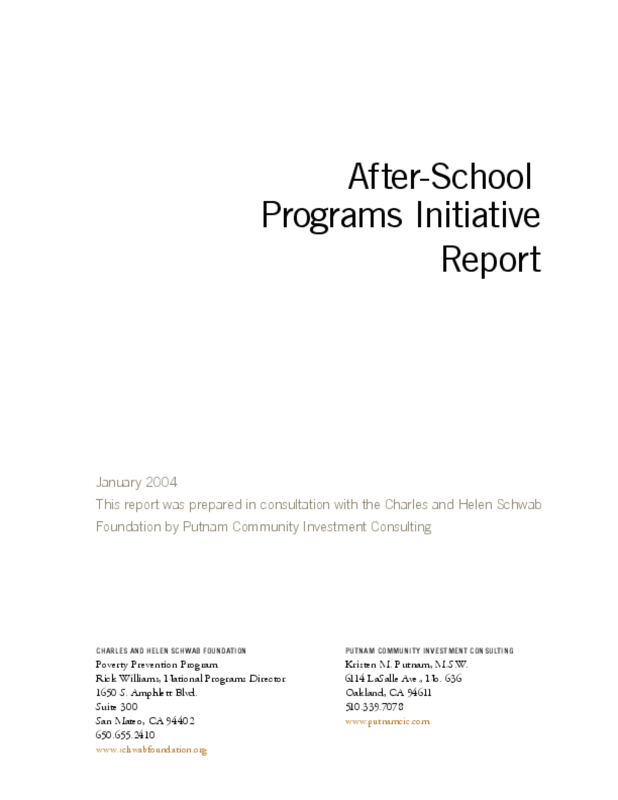 The Charles and Helen Schwab Foundation's After-School Programs Initiative is designed to increase the access of low-income children to high-quality after-school programs in California and to support the successful statewide implementation of Proposition 49, the After-School Education and Safety Program (ASESP) approved by voters in November 2002. This report is designed to assist other foundations that might be interested in supporting after-school programming in California. The report describes the need for after-school programs (especially those serving low-income communities), the impact of after-school programs on children, California's unique opportunity to provide after-school programs to every elementary and middle school student, and a variety of funding strategies that foundations can use to support the successful implementation of the ASESP. While our focus is on California, the movement to increase after-school programs using proven youth development strategies is nationwide, and national organizations are provided in the Resources section of this document. Copyright 2004 Charles and Helen Schwab Foundation, Putnam Consulting Group, Inc..